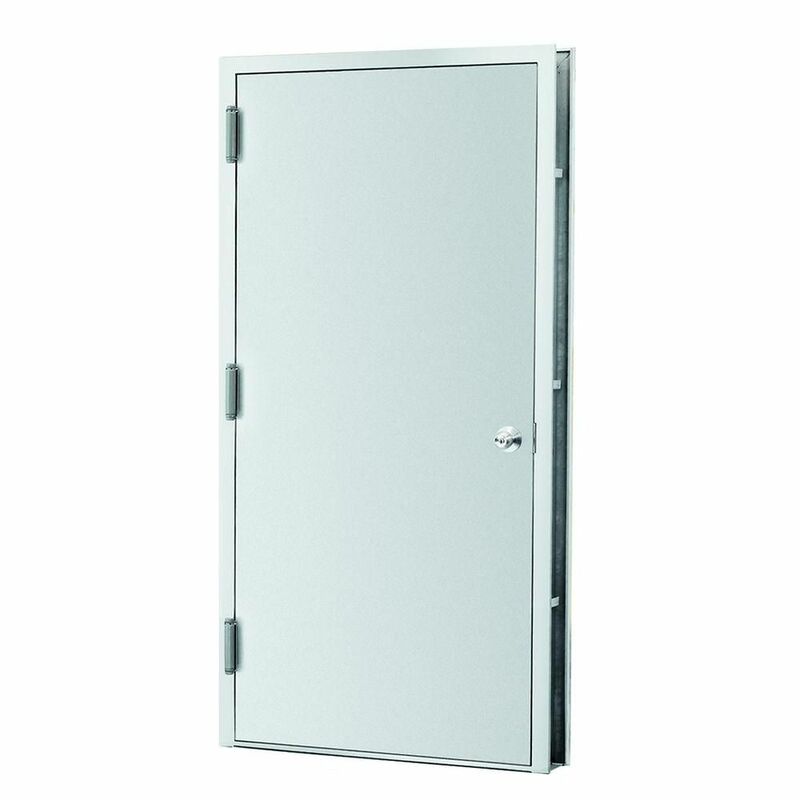 36x80 Steel Pre-Hung Unit R.H - ENERGY STAR® Heavy Duty Steel Flush Entrance unit with welded frame. Complete with a commercial grade ball knob entrance lockset and spring hinges in a prime coat finish. Equipped with a 90 min fire and smoke label. Manufactured with the highest quality Galvanneal Steel which looks like RAW STEEL but it actually is Mill primed and ready to paint once cleaned. Frame is installed before the wall is built and comes complete with combination anchors for either NEW masonry or NEW drywall applications. 36x80 Steel Pre-Hung Unit R.H - ENERGY STAR® is rated 4.1 out of 5 by 12. Rated 5 out of 5 by Ken from I needed a secure door for some extra security. I... I needed a secure door for some extra security. I spotted this door at Home Depot and for the price of this solid steel door was impressive. I had it installed and it’s one solid security measure that meets my expectations!!!! Rated 5 out of 5 by HomeDepotCustomer from Good door for the money. ... Good door for the money. Rated 4 out of 5 by Ryan from Solid doors however hardware was rubbish and had to buy new. Did not come with a sill. Seemingly ... Solid doors however hardware was rubbish and had to buy new. Did not come with a sill. Seemingly strong doors though. I bought 9. We will see how they hold up. Customer service was 7/10 when I called, basically referred me to Home Depot. Also, I’ll be shopping at Lowe’s as much as possible because of all the problems I have had with them. Just sold my stock in HD. They are loosing my trust. Rated 5 out of 5 by Wwest0331 from Great security door I own a business in the city of New Orleans as many know we have the crime rate of a 3rd world country. The last door we had was broken through twice in 4 weeks. The first time they pried the door from the locking mechanism. I reinforced the door so this could not happen again so on the 2nd attempt they ripped the entire door from the hinges. This new door is 10x's the existing door strength and durability. The old door may have weighed 45lbs the new steel door weighs over 125lbs.